This new book by David Salsburg is the first one in the ASA-CRC Series on Statistical Reasoning in Science and Society. Which explains why I heard about it both from CRC Press [as a suggested material for a review in CHANCE] and from the ASA [as mass emailing]. The name of the author did not ring a bell until I saw the line about his earlier The Lady Tasting Tea book, a best-seller in the category of “soft [meaning math- and formula-free] introduction to Statistics through picturesque characters”. Which I did not read either [but Bob Carpenter did]. It is not that there anything terrible with the book, which is partly based on the author’s own experience in a pharmaceutical company, but it does not seem to bring out any novelty for engaging into the study of statistics or for handling data in a more rational fashion. And I do not see which portion of the readership is targeted by the book, which is too allusive for academics and too academic for a general audience, who is not necessarily fascinated by the finer details of the history (and stories) of the field. As in The Lady Tasting Tea, the chapters constitute a collection of vignettes, rather than a coherent discourse leading to a theory or defending an overall argument. 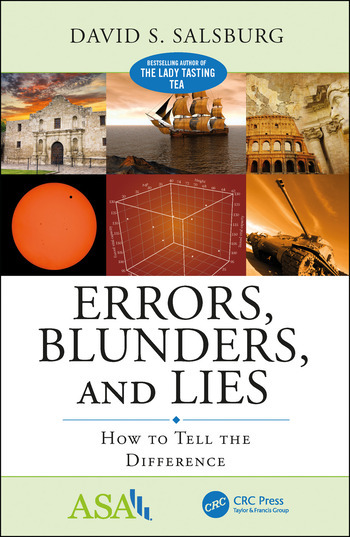 Some chapters are rather poor, like the initial chapter explaining the distinction between lies, blunders, and errors through the story of the measure of the distance from Earth to Sun by observing the transit of Venus, not that the story is uninteresting, far from it!, but I find it lacking in connecting with statistics [e.g., the meaning of a “correct” observation is never explained]. Or the chapter on the Princeton robustness study, where little is explained about the nature of the wrong distributions, which end up as specific contaminations impacting mostly the variance. And some examples are hardly convincing, like those on text analysis (Chapters 13, 14, 15), where there is little backup for using Benford’s law on such short datasets. Big data is understood only under the focus of large p, small n, which is small data in my opinion! (Not to mention a minor crime de lèse-majesté in calling Pierre-Simon Laplace Simon-Pierre Laplace! I would also have left the Marquis de aside as this title came to him during the Bourbon Restauration, despite him having served Napoléon for his entire reign.) And, as mentioned above, the book contains apologetic mathematics, which never cease to annoy me since apologies are not needed. While the maths formulas are needed. This entry was posted on July 9, 2017 at 12:17 am and is filed under Books, Kids, Statistics, University life with tags and lies, ASA, blunders, book review, CHANCE, CRC Press, errors, introductory textbooks, Pierre Simon Laplace, The Lady Tasting Tea. You can follow any responses to this entry through the RSS 2.0 feed. You can leave a response, or trackback from your own site.